Legumes are often combined with grains in the Mediterranean cuisine, with the most popular combination being lentils and rice. There are many variations of this simple but very nutritious dish. 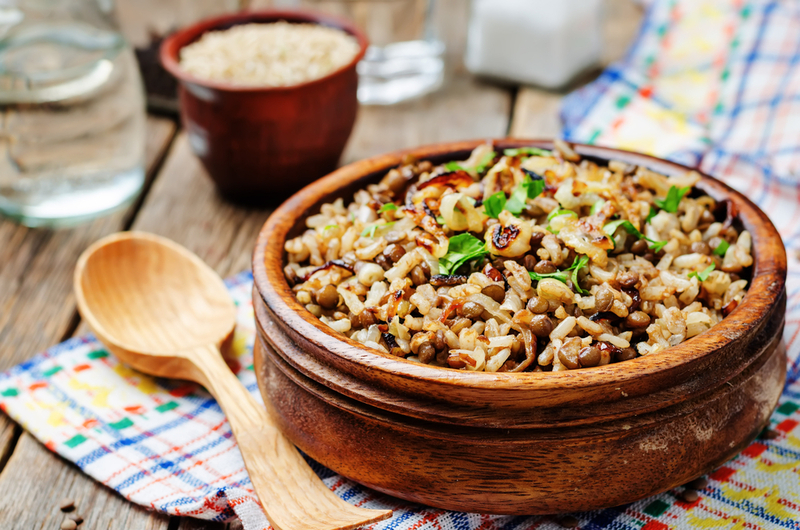 The Greek style lentils and rice dish is called “Fakorizo” and it is the recipe that we’ve prepared for you today! Place the lentils and bay leaf in a pot. Add water at an amount enough to cover the lentils by 3-4 cm. Cover the pot with a lid and bring the lentils to a boil over medium-high temperature. Lower the heat and simmer for approximately 20 minutes. Drain the lentils. Discard the bay leaf. Into another pot pour the oil and set the heat to medium. Add the onions, carrots and garlic and sauté for several minutes until the onions are soft and translucent. Add the lentils and sauté for a couple of minutes more. Stir in the stock, rice, red pepper flakes, salt, and black pepper. Cover the pot and bring the mixture to a boil. Once it boils, drop the heat to low and simmer until all the liquid is absorbed. Stir in the fresh parsley just before serving. This entry was posted in Around the Greek table, THE ART OF LIVING WELL / and tagged comfort food, lentils, rice, vegetarian on 21 September, 2018 by George Papageorgiou.